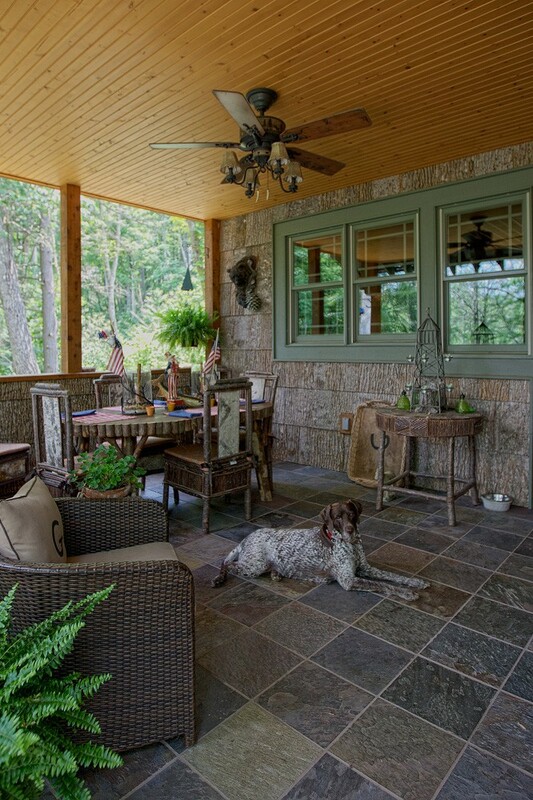 Most of us have a love and respect for nature, but Jim and Jo Ann Griffin have totally incorporated its perfection into their lives-and their 4,900-square-foot craftsman style mountain home in Foscoe, N.C., outside Boone. The couple’s primary residence is on Holden Beach, N.C., where Jim has been active in coastal real estate development since the early ’60s and deeply involved in the preservation of nature. As a testament to this commitment, Jim and his two partners in Holden Beach Enterprises have donated numerous tracts of land on the beach to the N.C. College of Agriculture and Life Science for conservation and research over the past 10 years. The Griffins, who divide their time between Holden Beach and Foscoe, have always been attracted to the mountains. They also love skiing and have been coming to the High Country with their two daughters, Ginny and Ashley, since the early ’80s. 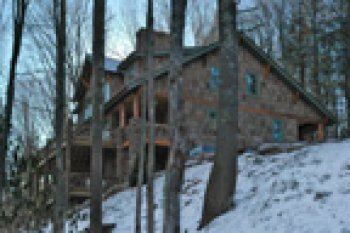 The Griffins bought a home on Sugar Mountain in 1985 and then a two-bedroom 1,700-square-foot cabin on four acres in Foscoe in 1998. In May of 2006 they moved into the new home, built on the same property, and turned the original cabin into a guesthouse, which is presently occupied by Ashley. Jo Ann grew up in a fox-hunting family in Wilmington, N.C., and always wanted a “lodge-type” home, so Jim went to work. He drew up rough house plans, inspired by famed architects Charlie and Henry Greene, whose artistry culminated in the design of the Gamble House (of the Proctor and Gamble family) in Pasadena, Calif., in 1908 and was a masterpiece of the American Arts ands Crafts movement. Woodborne Design in Boone did the finished blueprints from Jim’s drawings. The construction of the house was a hybrid project involving a team of true craftspeople personally selected by Jim, who acted as general contractor, with Charlie Hart as project manager. The floor plan is simple and practical and creates numerous conversation areas on its three levels. There are no twists or turns and few angles or hallways. 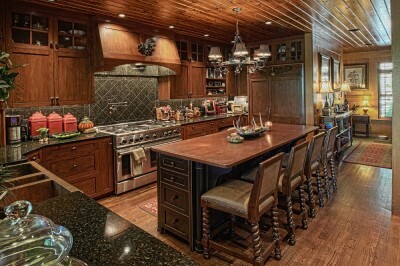 Doors blend with the paneling, following Jim’s vision of having everything disappear into the wood. On the bottom floor is a cozy fire-lit pub room with a pool table, chess table and bar, as well as a cherry wine cabinet that holds 120 bottles of the owners’ favorites. The attention to woodwork is reflected in a coffered ceiling made with 765 separate pieces of molding. made from a tree on a neighbor’s property at Holden Beach that was downed when Hurricane Charlie hit the coast three years ago, tops an oversized fireplace in the great room. 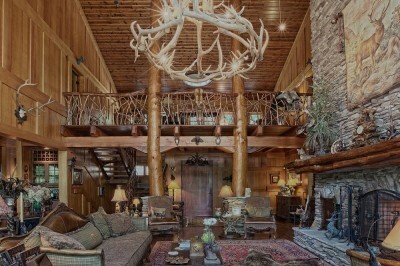 Acting as interior supports, columns of twin hemlock trees cleared from the property soar from the chestnut floors to the ceiling and create a tree-house effect. Jim loves to cook and designed an attractive and functional adjoining kitchen with hidden appliances, wormy chestnut cabinets, copper sinks and commercial range. Jo Ann has the eye of a professional decorator and created the interiors with a slow, sure hand and amazing attention to detail. 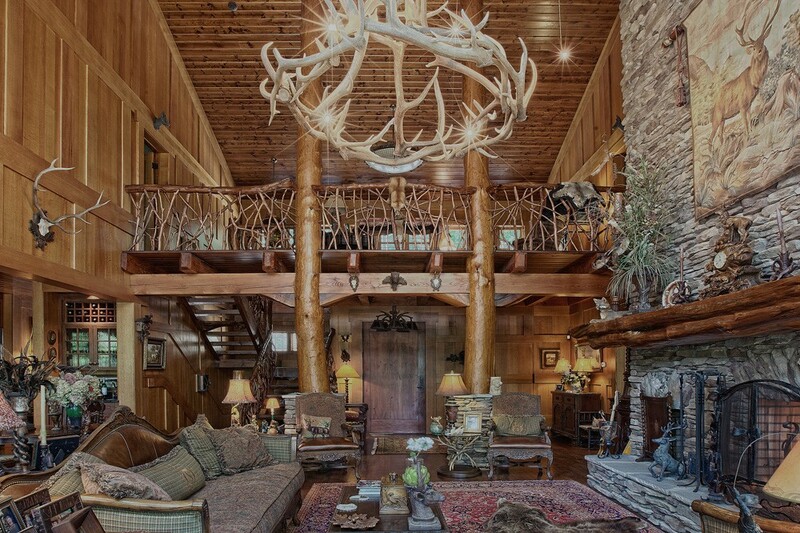 With the “hunt” in her blood, she pulled off the “lodge” feeling by filling the rooms with an artful blend of antiques and collectibles gathered from local retailers and set against a backdrop that wears the colors of nature. 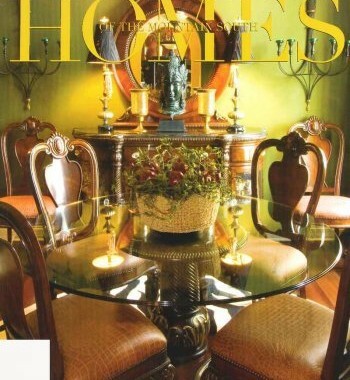 There are signs of influential sources from all over the world in the home’s impeccable elegance and exquisite furnishings and accent, but particular homage is paid to the Black Forest region of Germany, Austria and Switzerland. In the warm months, Jim and Jo Ann, casual people who are not out to impress, like to spend their time by the outdoor fireplace and eating area on their rustic deck made from 75-year-old locust trees. A line of comfortable rockers invites guests to relax. See more Photos of this home. Learn more about this home. Mountain Construction does custom home building in any building style, including conventional new homes, remodeling and restorations, log and timber frame homes and structural insulated panel homes.